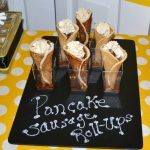 Easy- to-make buttermilk pancakes and cooked sausage links are rolled into cones and served in individual cups with maple syrup. The pancakes are flavored with maple balsamic vinegar for a new twist on making pancakes. To finish the pancake and sausage breakfast roll ups, fresh cinnamon whipped cream is piped inside the cone and sprinkled with ground cinnamon. So much fun to serve and eat!!! 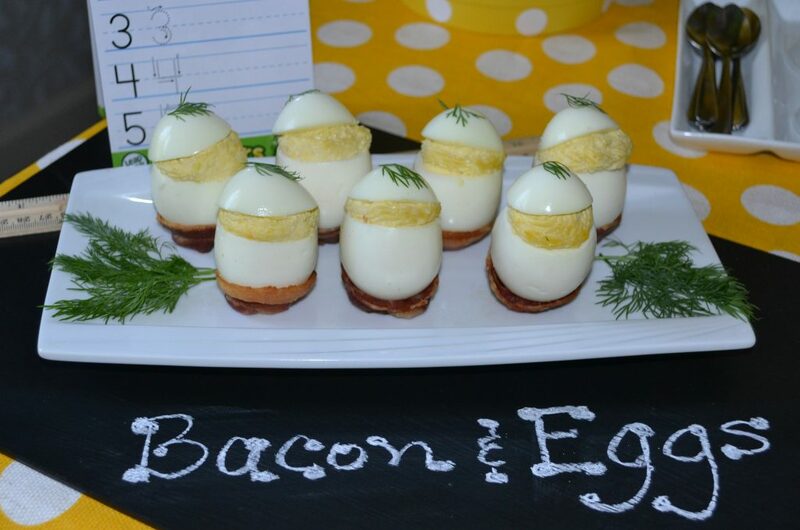 Your guests will love this easy and fun recipe. 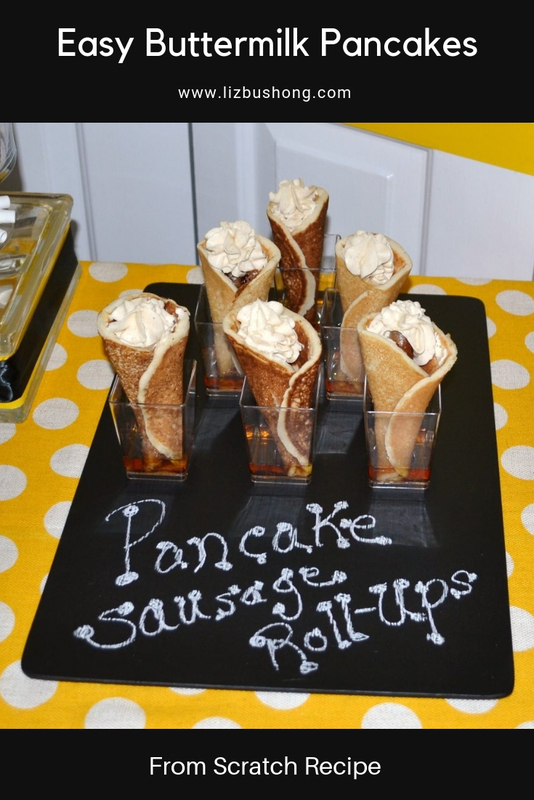 Easy Buttermilk Pancakes filled with cooked sausage links rolled like a cone garnished with cream cheese whipped cream filling and served in maple syrup cups. Pancakes and sausages can be made-a- head, cooked, cooled -wrapped, and frozen up to 2 weeks in advance. In large mixing bowl, combine flour, salt, sugar, baking powder, baking soda and spices. Whisk in buttermilk, vegetable oil, eggs, and extracts. Blend well. Lightly spray skillet or griddle with cooking spray. Pour 3-4 tablespoons of pancake batter on lightly sprayed cast iron skillet or griddle. Cook pancakes over medium high heat turning over cakes at 3 minutes for each side. Remove from skillet and immediately roll pancakes into a cone shape. Cover & set aside. In separate chilled mixing bowl with wire whisk, whip heavy whipping cream with confectioner’s sugar. In another small bowl, beat together softened cream cheese and ground cinnamon. Add whipped cream to cream cheese mixture. Beat to combine. Place filling into a disposable pastry bag fitted with a star tip # 1 M.
When ready to serve, place cooked sausage link inside the rolled pancake. Position pancake in individual serving square cups with 2 teaspoons of maple syrup. Place in microwave to reheat before serving. Pipe cream cheese filling on top of wrapped pancake cone right before serving. Cream Bouquet is a concentrated flavoring that tastes like a wedding cake, a blend of lemon, orange, and vanilla. Small cups can be found on line or party goods store. Maple Balsamic Vinegar is delicious and used in many recipes. Ice cream, cookies, cakes, salads.. even pancakes.